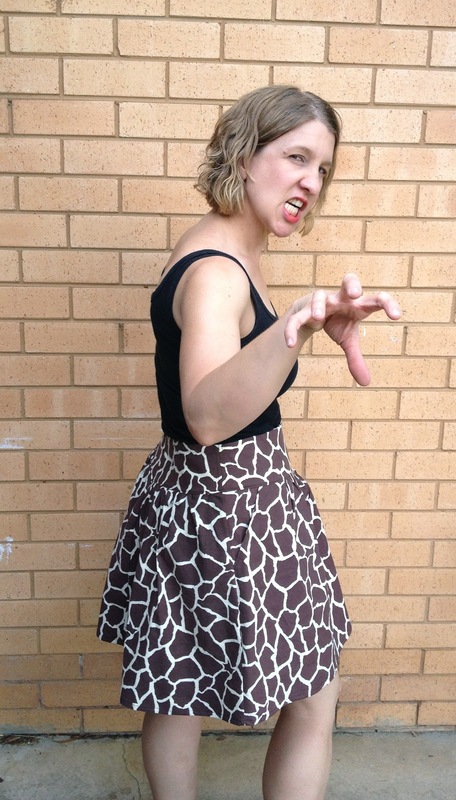 When Annie, rocking it over at Pretty Grievences, was all throwing down gauntlets for sewing with animal prints I was up for the challenge. And I’m not going to lie. My first thought was some kind of hideous leopard print cat suit that I could pretend to be Cheetara from ThunderCats in complete with face paint. Yup. This is what happens when you wake the crazy sewing beast. But imagine my despair when I made it over to Spotlight to discover a complete lack of stretch cheetah print. Heartbreaking I tell you. As I forlornly dragged my feet through the aisles I begged the animal print gods to bestow upon me any inspiration they could muster. Zebra! Leopard! Aardvark! I’d take it. Alas, I could find none. So I was rather surprised when I pottered on over to the reduced to clear quilting section and the print of the most elegant of the beasts on the savannah was there to greet me. Goodbye Cheetara and hello Giraffe of Glory! Ahh! It’s the excuse for more ridiculous photos than normal! That’s what I’m talking about. This skirt came together in a jiffy and I must admit to having super fun topstitching like a boss. Oh, dear. It’s been four sentences- time for a photo! The pockets. I’m totes converting to slash pockets (well except for the glory that is welt pockets because they are awesome) I’m thinking next time I make slash pockets I will go for a colour contrast to really play them up. Yup, I’m living on the edge. Try a size down. I had to take in 2″ on each side of the waist. At the centre back seam. Because I neglected to make a muslin. And I’d sewn those rad pockets. And perhaps serged them in place too. And they looked really good. And I didn’t want to unpick everything. And now I have the world’s tiniest centre back panel. Yeah, I live on the edge AND learnt a lesson. Fierce. Try a plain fabric and some sassy piping. I really need to get over my fear of piping. 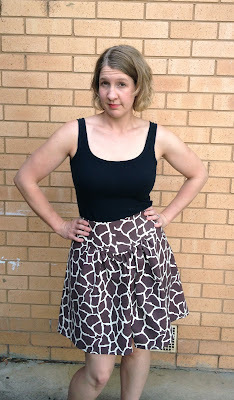 I think the cray-cray piecing details on this skirt is its feature design element and piping would help emphasise that. So what have I learnt from this endeavour? 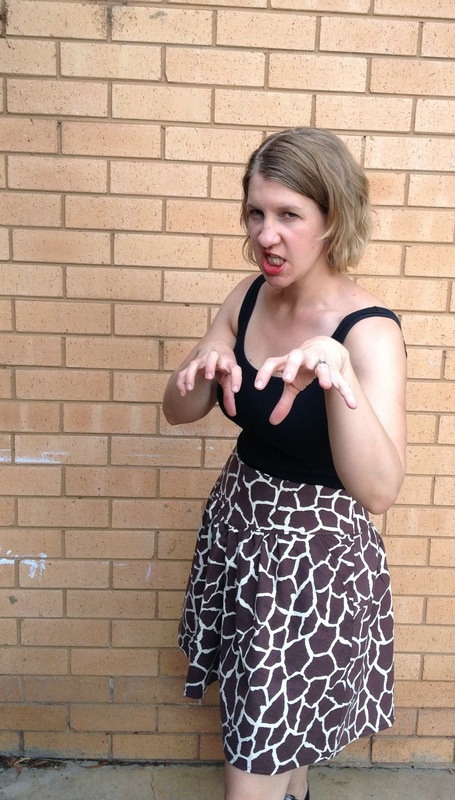 Show no fear in the jungle when it comes to animal prints or they will devour you! I really have a hankering to make an awesome leopard print circle skirt now… But first I need to finish my sewing dare from Gillian over at Crafting a Rainbow. I have been challenged to make something in a solid colour. Yup. No prints to hide mistakes and fitting issues- scary stuff. But I can do this because I am fierce like a tiger. ROWWWWWR! Amanda + Sureau = luuuurve! I nearly bought some of that. Wishing I did now- that skirt looks fab! I love this so much!!! Why don’t I have more skirts??? I love the crescent skirt too! 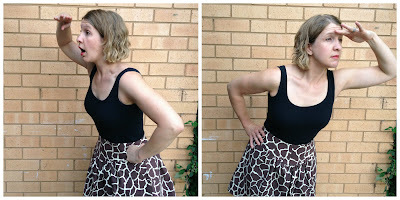 And your fabric is amazing 🙂 when I heard about jungle January I would never have thought of giraffe print, I love it even though I’m absolutely not into animal prints..
Really cleanly done, you are getting bloody good at this sewing malarky… ain’t ya?! raaawwwrrr indeed! Great looking skirt! Hope Janome recovers for at least a while longer, I can’t wait to see what you come up with next! I’ve run into the same problem with pockets a few times myself.. you get the beautifully finished and then realize the front is too big! grrr. I’d go for the quick solution there too myself! Skirt looks fab!!!! Now for the dread solids! I feel like cookie skirt could be a Project Runway challenge. 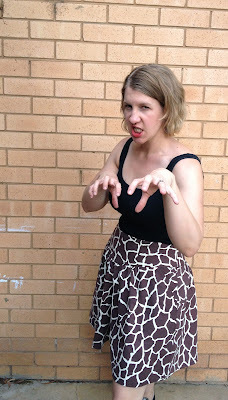 That giraffe print is adorable, as is the skirt; though I am a little sad about the lack of Thundercats spandex. cookies of the sewing world. AWESOME. i love your pictures so much i want to cry. 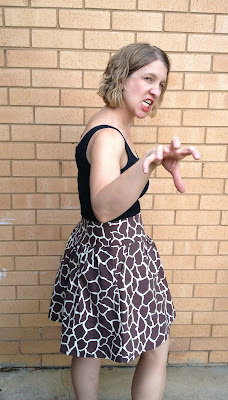 That skirt is LUSH, can I borrow it for when I go on safari later this year please? And you must make a Cheetara catsuit. You simply MUST. Love this! Love the giraffe print. After I finished my first Crescent skirt, I had the same reaction you did, that I want to make another that highlights the seaming details. I’d love a lightweight denim one with bright colored topstitching. teehee! My poor Janome, Chris. It breaks my heart. I need her to keep holding on for a few months as I have a new pair of skates being made at the moment. GAH! You can do it Janome! 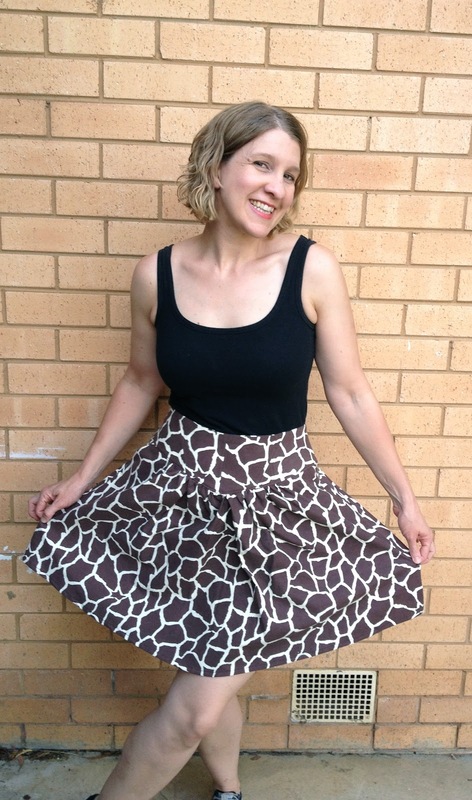 Annie, you need a Giraffe of Glory skirt STAT! Thanks, Sophie! I was rather surprised to find giraffe print too 😀 I’m deciding Team Herbivore is so much cooler- I mean giraffe AND zebra?! Win! Thanks, Caffy 🙂 I’m mos def giving it a red hot go! I’m so geared up for this, Miss Gillian! I’ve got my fabric cut and ready to rock. It’s going to be RAD! Charlotte, the lack of a Cheetara catsuit is something that is going to haunt my dreams for a long time I feel. All I have to say to you is THUDERCATS ARE GO! It’s such a pain, isn’t it Rox? Normally I make a muslin but I was feeling confident with this project- epic fail Amanda. This is what happens when I live on the edge… teehee! Thundercats are go! Now I have that stuck in my head, lol! 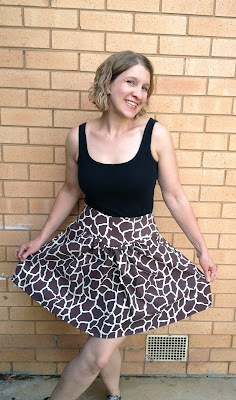 Jacq, I think the cookie skirt needs to happen! Thanks, Suzy! Thunder, thunder, thunder, thunder CATS! 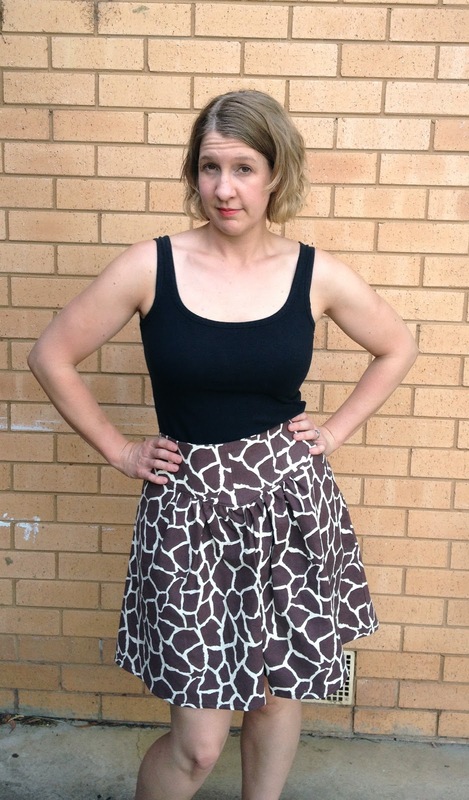 Awesome skirt and awesome fabric! Can’t wait for your next sewing challenge. I need to get over my fear of piping too. I have seen some awesome dresses with piping detail and I really want to make one. Thanks, Kat! Piping is darn scary- I think it is time we have a go at it! Mmmmmm…cookie skirt. I would buy that. You and me both, Suzanne. You and me both! Merci, Sonja! And bonus points for the use of rad! It’s always time for catsuits, Lizzie! I hope you find some great fabric STAT! This skirt is awesomesauce! And “it’s been four sentences, need to put in a picture” LOL! Bummer about the catsuit, maybe next time? Bad puns are always welcome here, Carolyn! That catsuit will be mine, CG! BWAH HA HA! Noice! Who said that quilting cottons are not to be used for awesome clothes. We live in exciting times, Bun! Craziness! Cookie skirt!?! I believe it can be done. I’ve seen crazier out there. I mean if Lady Gaga can rock a meat dress surely you could pull off a cookie skirt! I just love your posts, your writing is so entertaining! And love the skirt! Lol. Cookies Sew Along!! Do we need a sewing machine or oven? In any case, that’s great! Love your skirt and I think it will look wonderful in two colors, dark colored for the top yoke and light colored for shirred .. I love the print you chose! It makes for a cute skirt without looking overdone like leopard sometimes can. beautiful print. I am in awe about how fast you work. Great skirt! 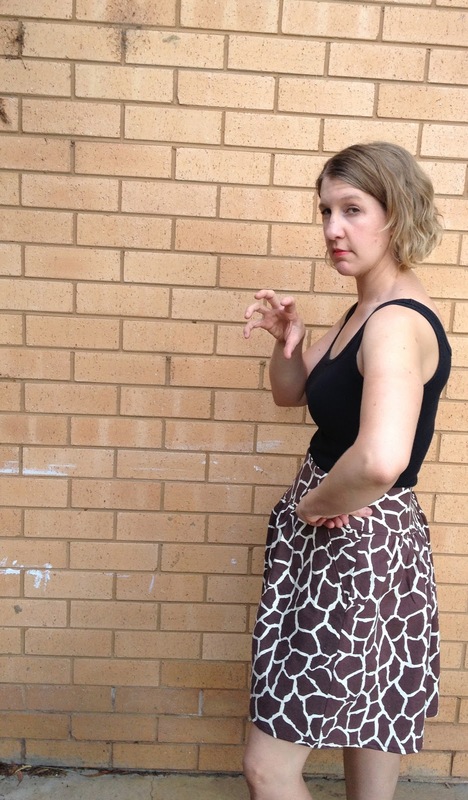 I love the crescent pattern and your animal print fabric is fun and wearable. Thanks, Megan! I am rather smitten with the Giraffe of Glory! Merci, Kestrel 🙂 It’s a pretty snazzy pattern!